Sales on complete auto pilot. Email marketing is a critical part to any business – whether your an affiliate, blogger or run an e-commerce store. When someone signs up to your email list they are giving you permission to invade their personal life any time you want. Getting Started With Email Marketing Right Now! Email marketing is so so important. You get instant traffic, automate relationships, it’s evergreen and very cost effective. My #1 goal with the blog isn’t to get people to click on affiliate links but for them to subscribe to my email list. If you have ever heard the phrase “the money is in the list” – it is true, and if you haven’t started an email list yet you are leaving an awful lot of money on the table. The first and most important reason is having the ability to directly communicate with your audience at the push of a button. You can reach out to thousands of people in an instant to take action, whether that is to read your new post or check out a special offer. Having the ability to control thousands of peoples attention and direct it wherever you choose is like having super powers! One of my favourite uses of email marketing is to automate relationship building with your subscribers. I do this through my autoresponder sequence which is pre-written set of emails scheduled to go out at set times after someone has subscribed. I will explain more about this & how I do it later in the article along with all of the email templates I use! No matter what happens you will always have your email list. What if one day your site gets penalised by Google and disappears from the rankings? Suddenly 80% of your traffic is gone and so is your income! Your email list isn’t subject to the same risks as your website and will stay with you forever. You can start your email list for $1 which not only makes it cost effective, it makes it an absolute no brainer! What other form of marketing can offer all of these benefits and more for just $1? 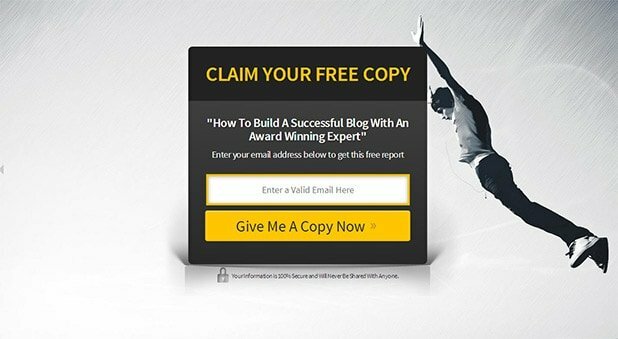 So before showing you how you can get started with my email marketing strategy I’m going to reveal precisely how I use email marketing to drive this blog. This strategy builds relationships, drives a constant stream of traffic, provides new user generated content, gets new social shares & generates sales on complete auto pilot. My email marketing service of choice is Aweber and if you want to follow along with this tutorial series I suggest you use them as well! The most important part to any email list is getting subscribers – without subscribers your email list is pretty useless. Those are just some of the most common ways of driving subscribers to your email list and they are the exact methods that I use on this blog! I have a number of opt in forms placed around the blog asking people to subscribe by entering their name/email address. The first one is in the sidebar, right at the top of the blog. The next one you will see is also placed in the sidebar but stands out much more and follows you down the page. Subscribe to this award winning blog now to get free updates. The last opt in form you will see on the blog is at the end of posts after someone has finished reading. As you can see I like to place opt in forms everywhere! I have them placed at every opportunity to grab as many subscribers as possible! In fact there are a total of 8 opt in forms on my about page – that might seem like overkill but the page converts 1 in 4 visitors into a new subscriber! I also use dedicated email opt in landing pages to generate subscribers. I use LeadPages & this Facebook advertising tutorial to target blog visitors. This method costs me $0.63 per new subscriber but each new subscriber is actually worth $17.81 to me (more on this later). I get a lot of enquires via my contact page and I figured that anyone that wanted to get in touch with me, would also be interested in joining my email list. I use the Contact Form 7 plugin to power the contact form and use this plugin to connect it with Aweber. So now when someone sends me a message via the contact form, they get an email asking them to confirm their email subscription. The other way I capture email subscribers on the blog is when someone registers on the forum. Again I figured anyone joining the forum would benefit from the email newsletter and I use this plugin to do that easily! This is the perfect time to ask because once someone has taken action once (submitted a comment) they will take action again (email subscription) if you ask them to! You will notice I’m using the in content opt in form here but the redirect to that page is done with this plugin. Once they click the link to confirm their email address they get taken to the thank you page. Now at this point most people would end the user journey, but remember when I told you that if people take action once they will take action again if you ask them to? So I also ask people to connect with me on Google+ – you could ask people to follow you on Twitter, like your Facebook page, tell their friends or whatever you choose. That is all there is to it – that person is now subscribed to my email list! But that is only the start, the next step is where the magic really happens! An email autoresponder is essentially a set of pre-written emails that gets sent to every new subscriber. This is the bit that builds relationships, drives a constant stream of traffic, provides new user generated content, gets new social shares & generates sales on complete auto pilot. Right now I have a total of 56 emails in my autoresponder sequence that gets sent out 1 per week keeping new email subscribers engaged with my blog for over a year automatically. As you can see Aweber makes it really easy to set up & schedule! There are lots of different ways you can use email autoresponders and I’m going to show you a few of the different approaches & email templates that I use once someone has subscribed. The first email new subscribers receive is the welcome message which is sent immediately after they confirm their email address. This email is simply to welcome them to the newsletter but also to set expectations of what they will be receiving from me each week. I also ask people to connect with me on social media so I have another way to reach my subscribers. The next email goes out 2 days later and invites the subscriber to ask me any internet marketing question they like! This email is designed to do a number of things. Primarily it helps to create a stronger relationship with the new subscriber by offering to personally help them. But what is also does is drives people into the BBPress forum which has a number of benefits like creating new threads/pages which get indexed/found by Google. It also gives them a reason to keep coming back to the site and getting involved with the hidden community on the blog. Even if people don’t join the forum to ask a question, they fact that you have reached out and offered to help them really sets the tone of the relationship. The vast majority of the emails in my autoresponder sequence are used to breathe new life into old content that would otherwise be buried away deep in the archives. Not only does this keep people constantly engaged with my blog it also provides a steady stream of traffic, comments, social shares & affiliate clicks across every post on the blog. Without an email autoresponder most of these posts would just be collecting dust – but now they are a powerful business asset I can use over and over again. Not only does this email provide a constant stream of new content ideas every week, it also helps to strengthen the relationship with subscribers further. People really appreciate the fact that you are listening to them and a lot of the tutorials I have published on this blog are the result of people replying to this email and asking for them. There is always room to improve your site and again, the best people to provide that are the people that actually visit your site. By simply asking for 1 thing they like about the blog, 1 thing they don’t like and 1 thing they would change immediately you get some amazing feedback. That feedback has helped shape the direction of the blog while strengthening relationships with subscribers at the same time! After someone has been subscribed for a while I also ask them to provide a testimonial for the blog. It is amazing to read the testimonials people provide and how the blog has helped them – in some cases tutorials have helped change peoples lives! I haven’t published any of these testimonials yet, but I have a huge library of them ready to go when I need them! It is also important to show your gratitude to your subscribers & thank them for supporting you. Some of the responses I get from this email touch me right in the feels to say the least! I hope you are starting to understand why my #1 goal with the blog is to get people to subscribe to my email list. The benefits are huge creating strong relationships while driving traffic, comments & social shares to old post. At the same time it provides new content ideas, testimonials & feedback to improve the blog. You can start your email list for just $1 right now and start collecting subscribers for your email list. Everyday that you are not doing this – your are missing out in a big big way. The first thing you need to do is sign up to Aweber – it will only cost you a dollar to get started! I have always used Aweber because they are easy to use, very affordable, offer great deliverability and lighting fast support. They are the best email marketing service provider in my experience. You can also create separate email lists for each website you own using a single Aweber account. Once you have done that, login to your account! Now you need to setup your first email list. I create a separate email list for each of my websites as it only takes a few minutes. Next Aweber will take you through the setup wizard to finish creating your new list. It will also ask you for an address, this address will get shown at the bottom of each email you send to comply with the Can-Spam act. If you don’t have a business address and are worried about using your home address, you may want to use a different address. You will also be asked at this point to provide a sender email – this is the email the emails will get sent ‘from’ so make sure this is an active email address that you monitor in case anyone replys, which they will! As you can see it doesn’t have to be anything special. Last but not least you need to setup your confirmation message. This is the email confirmation that people receive when they sign up to your list to confirm their email address. Once that is done – you have successfully created your first email list! Now all we need to do to start collecting email subscribers is to create an opt in form and add it to your site. To do that click on Sign Up Forms and then click on Create Your First Sign Up Form. The first thing you need to do is pick a template that you like, Aweber provide an endless amount of designs for you to choose from! Just scroll through them all until you find one you like – you can even customise it if you want. Once you have done that move through the rest of the steps leaving everything at default and save your form. There are a few different ways to add the opt in form to your site. If you use WordPress you can just use the official plugin which makes it really easy to add the opt in form to your sidebar. If you get stuck with the plugin then check out Awebers guide on how to set it up properly. The plugin will also add a tickbox that allows commenter’s to sign up to your newsletter as well! If you don’t use WordPress then you can just take the code that Aweber provides and paste it into your sites template where you want the opt in form to appear. If you aren’t comfortable with doing that – there is also the option to email the code to your developer in 1 click so they can add it for you! That is all there is to creating your email list & creating your first opt in form. Once you have deployed the opt in form on your site it will start collecting email subscribers for you instantly! Feel free to give it a test yourself and see how everything fits together to help build your understanding. To help avoid information overload I have broken my email marketing guide into a small series of posts. You can read the next part of the email marketing tutorial series to learn about building an effective email autoresponder! I see you send out emails every week or so. Some people have been saying to send emails every day to have a better relationship with readers. What are your thoughts about sending emails everyday VS every week? Thats true, once a few days that means. What an awesome post! Really enjoyed reading it. I just really started focusing heavily on email marketing these last couple months. By far my most effective way of making money online. In the midst of scaling up using solo ads directed to my squeeze page and sales funnel. Good to hear – how are you finding solo ads for building your list? I ran 100 clicks 2 days ago to test a funnel I quickly put together. The 100 clicks cost me $35. Over delivery with 128 clicks coming in with a massive opt in rate! My squeeze page did very well and it is so basic! Got 5 sales totalling $135 so a very good result. That being said, I ran another solo of 100 clicks yesterday, opt in rate is still very good but no sales as of yet, however order is still being delivered. That’s pretty good going! It’s something I’m going to start experimenting with using Udimi – do you recommend any other solo sources? I have bought a couple through the Warrior Forum which were good, in the classifieds ads section. I’ll be sticking with Udimi for the time though, seems to be a good number of reputable sellers. I like the rating system which is used. Yeah that’s what I like about it as well, easy to get stung with fake clicks/dodgy sellers! Awesome Strategy man and thanks for the form plugin. wow a lot of reading! lol seriously though that’s a good post and something I am working on myself at the minute for my cleaning business. I’ve always complied clients information in diary format i.e. name, address, email, telephone number, what i cleaned for them, if they where annoying customers! etc etc its going to typing up but will be worth having this information in a proper database ready to send out email reminders in the quieter season. Hahaha I like your thinking Jack! Anther great post Matt :), email marketing is best way to make money and i am waiting for your upcoming tutorials int this topic. Another great tutorial from you, Matt. I look forward to the other parts of the series. Premium Tutorial as always matt. Every time I saw your email first thing I do is click on the link and it didnt dissapoint me each time. cheers! Great to hear :) What would you like to see in part 2? I’m curious, would you be willing to share the percentage of subscribers you get from each of your six avenues? Very very good question I will have to take a look if I have all of that data available but I suspect that I do! But off the top of my head #1 and #2 account for the majority! Great post Matt… I was curious if you’ve ever dealt with, or heard any feedback on GetResponse? I signed up with them a couple of months back, and I’ve been happy with them so far. However, I was definitely torn between Aweber and GetResponse…(I actually signed up with both during the trial period), and the only reason I chose GR, was that they allow you to create and host landing pages on their site. At the time, that seemed like a novel idea, so I went with them. As it turns out, I’m not really using them after all. Anyway, just curious what you thought about GR, and I guess what sold you on Aweber over GR and other email providers? I don’t have that much experience with GetResponse but I have been using Aweber for over 6 years and it’s rare to be with a company that long and have nothing bad to say about them! In fact my account is so old, I have it locked in at super cheap pricing compared to what they charge today lol But to be honest Aweber and GetResponse pretty much do similar things from what I understand. For landing pages I have found LeadPages to be absolutely awesome! Neil Patel from QuickSprout switched from Aweber to GetResponse claiming that the latter has a better delivery rate. Interesting! Have you got a link for that? Hey Matt, I am wondering which plugin you use to create the in post opt-in form and also the form at end of post. They look great and clean. 1. In your optin form you clearly mention “get the latest blog updates” I just wonder if people don’t get annoyed when you actually send them some of your old blog posts and not the latest ones. 2. Would you be able to share with us your click through rate in your auto responder? 3. I was sure that you also capture optins using a popup – I couldn’t see that you mention it. Great info as usual. Can’t wait for the rest of the tutorial! Just wondering, besides Facebook, do you use any other paid traffic to drive readers to your landing page? Question : So I figure that when you recycle content, like, say, this email marketing one, do you keep all comments visible or drop off old ones after x amount of time to keep it “fresh” so when I see the email and click through the content looks current, plus, it keeps the comments stream from pushing this form too low to get used. OR, do you create a new page/post and canonicalise? Thanks for the reminder that I’m an epic failure as far as what I do with my email list. I know I need to get better and build up my autoresponder series which currently has only a welcome message and one other email. Thanks for the tip on the add on for Contact Form 7 – I stopped using that plugin, but now that I know about the add on I think I will re-install it. I get several contact form submissions every week and never thought to get them added to my list. Sweet! I was wondering Matthew… how do you manage to integrate the Blog updates with the list? I’d like to build lists to my coffee site, perhaps 3 lists (coffee, machines & the blog updates). I’d like to keep the lists a little more separate, but how do I keep the RSS posted on Aweber? Is that simple to set up so readers of both lists ALSO get the blog updates? I love the way you drive traffic with your short punchy blog updates, and because they’re short, written well and I can easily choose to visit the link or not… I think they work well. I’d like to emulate that on my lists, too. I try to pay attention to both what you say & what you do. Both are very informative. Detailed presentation there. Say you have all that set up, how do you get people to visit your site. You might have the auto responder set with follow up messages and everything you presented, but it is like having a net where there is no fish. How can I make the fish come to my net. Thank Matt for some useful opt in plugin, do you ever use mailchimp for email marketing? The quality of your posts never drop below ‘outstanding’ Matt and, as always, are packed with tons of very useful information that can be used by anyone. There’s not many people like you who share so freely and with no strings attached. A lot of marketers don’t seem to take email marketing seriously if they do it at all. Like you I use it to drive traffic back to my older posts so they continually get exposure. My email list is currently sending around 5,000 additional visitors to my site every month, a 3rd of my overall traffic. And I use it to build trust and a relationship with my subs. I also reach out and ask them what they need help with and I reply to every email. Most of them tell me they are surprised I replied as most bloggers / marketers they email never do. Email marketing is my #1 focus on all my projects. Yeah I get replys like that as well, people are genuinely surprised they can talk with you directly! Thanks for this Matt. I am looking into doing some email marketing so this will certainly help. I am really disappointed that you do not take my comments and questions into consideration. Not that you have to though!! In this competitive business world marketing is the most important practice for any business to stay visible for the people. At present email marketing is the most appropriate way for promotion of any business or service. It’s a cost effective and fastest technique through which you can target a huge number of people very easily. All I can say is wow for this tutorial. I have been looking for info to decide between Aweber and Get Response but after reading through your tut, you’ve convinced me, I am just trying to get a good auto responder series and need some time to add my personal touch to it and then I’ll be back to buy through you link since you have been such a major help! Thanks and have a nice day Matt! Hey dude, I just couldn’t resist, had to signup and play with Aweber a bit, as wrong as that sounds lol. I also noticed you running content lockers with PDF downloads, is there a guide on that too, like reviews or something that points me in the direction of what the best lockers to use? I think your blog leads the way for us newbies, thanks so much! I’m using https://www.matthewwoodward.co.uk/get/sociallocker/ to do that! Thanks Matt, I will check it out shortly. Figure I should first finish writing my reviews and guides before it’s worth investing in the content locker but at least I know where to get it now. ah can’t wait for the next part, should be good, been following you step by step and learning a lot. I already signed up to Aweber through your link, pretty cool so far. Just need to figure out the auto-responder stuff still. Really helpful guide. two years back i started email marketing, but i could not understand how to run. This is very nice guide for me. I will start this immediately. Awber is good service. what about getresponse.com. Which one is better to start for new affiliate marketing starters. Please suggest me. Thank you for this nice tutorial. Glad to be of service, I have always used Aweber personally! I never thought with WordPress running an email marketing campaign would be this easy. Spent some time at Aweber after a very long time. Having spent time there already and now again, the old question haunts me again (this is where I left the thought of campaign). Campaigns are successful if we have more visitors and the visitors are more if the campaigns are successful. The question now remains is how to increase the visitors to the website, who opt-in to participate into email campaigns, that too without email campaign? Hi there – as I was taking some notes from one of your posts, I noticed the copy-paste function attached some of your info when I pasted it into Word. Genius! How do you do that? Even though this is an older post its very helpful. I signed up for AWeber but when I imported the emails you have, it only loaded 10. It looked like you had a lot more in the sequence. Perhaps I did something wrong? Well nothing has changed since I wrote it. Yes I removed some of the series because people were ignoring my advice to make it their own and just loading them up and sending them out, I got a number of complaints that people were receiving exactly the same emails as me and was wondering who ripped who off. Thanks for the explanation and thanks for sharing this with us. I just wanted to make sure it wasn’t something I was doing wrong. I’m definitely not out to rip you off. I do like the way you’ve worded some of your more generic emails and the structure of you tutorial emails and its be helpful as a guide to craft my own. One other question if you don’t mind… in another post about the subscriber resources, you mentioned updating your first email to link to the resource page. Is this the sequence you made that change to or do you have a separate sequence for the content upgrades? Yes this is the sequence I made that change to, I haven’t created separates sequences but I should. You say in your post that each new subscriber is actually worth $17.81: so, this is simple to calcule to ROI. Is there any place in another post on your blog where you explain what you do and which tools you use in order to calculate how much earn you every new subscriber? Thanks a lot for your great content! Yes I can track which traffic is from email campaigns and which isn’t, so I take that % over a 90 day period and apply it to the overall affiliate income in the same period. Then divide that by the number of subscribers. It’s not an exact science but it gives you a solid ball park. If you get a more precise method to calculate, I’ll be very curious to know it. Thanks a lot! I would love to know a precise way but given I need to track conversions on so many different affiliate programs that don’t offer you the opportunity to place conversion pixels its very difficult. I can’t put it any better. I have come to love your information! You give quality and you are direct to the point. You’re so interesting! I don’t believe I have truly read through anything like that before. You wrote here all major facts for email marketing conversion. I think behavior tracking is the one of the best way to target your right buyers. No problem Sean, glad to be of service! Don’t forget about parts 2 and 3 as well! Sure, I’m just going to read next parts. Expecting some more useful info about email marketing. No problem Sean, thanks for reading! I found the example emails really helpful. I run a saas, so I tweaked the emails to ask for feedback on the app instead of the blog. Looking forward to see what kind of engagement it gives. Great to hear Tim, I hope you see awesome results! Great! Great! Great post! Everything one needs to know about internet marketing. I have bookmarked the page as I will definitely be coming back to read it again. As usual, great detailed post, full of practical concepts.